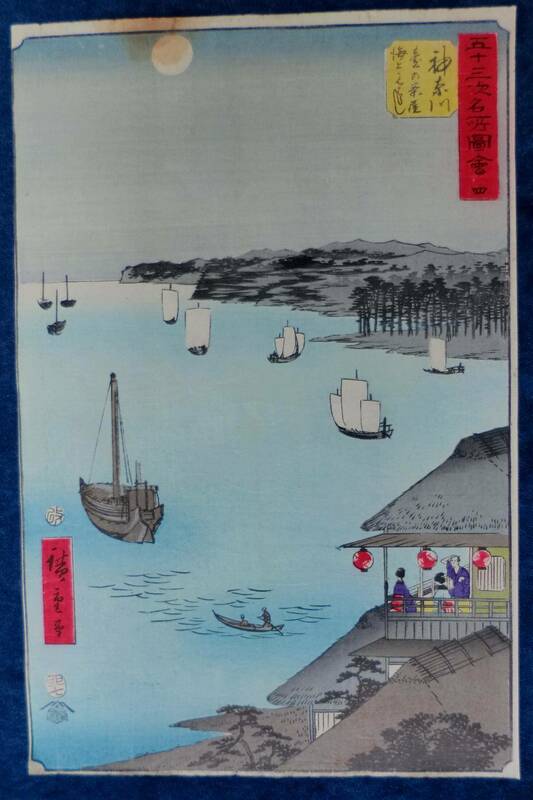 ANDO HIROSHIGE was born in Edo in 1797 and Died in 1858. His father was a fire warden at Edo Castle but Ando showed an interest in art. 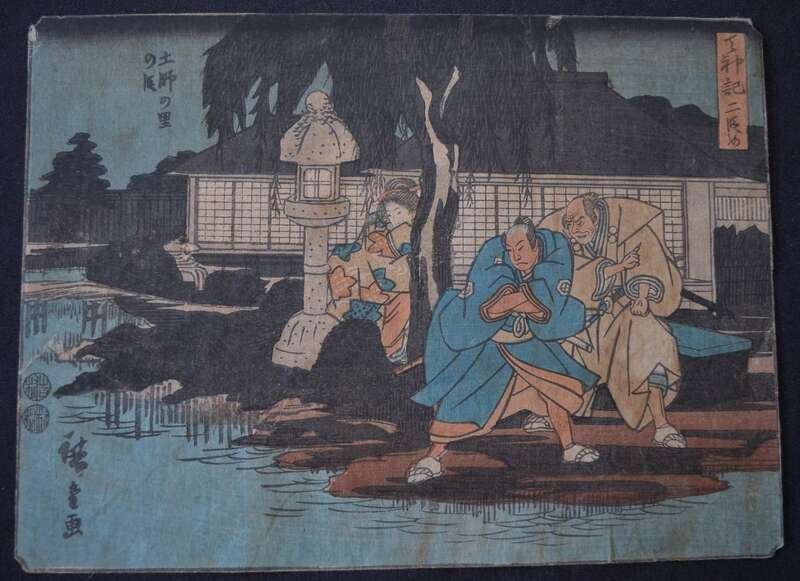 At 12 Years of Age both his parents died and, after studying for a time under Okajime Rinsai, in 1799 he joined the famous Utagawa Painting School under Toyohiro Utagawa. By 1812 he was given permission to use the Utagawa name in conjunction with his own and created a large number of figure woodblocks including those of beautiful women of the day. In 1831 he was asked to be a minor retainer on an official journey of the Shogun of the Kyoto Court along the Tokaido trail and in the following year produced the first of 13 separate editions of the 53 Stations of the Tokaido Trail in different formats and style the final one created in 1857. 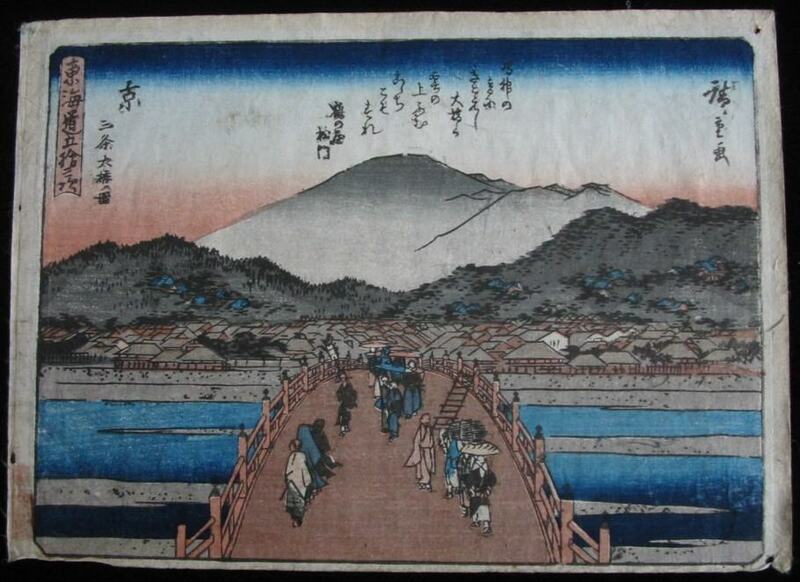 He produced more than 8000 woodblocks in his career including a number of landscape and historical series. AUTHENTICITY: Rectangular Senichi Publisher’s Seal and Round Aratame Censor Seal for the Year 1836 in Right of Scene alongside the Artist’s Signature. 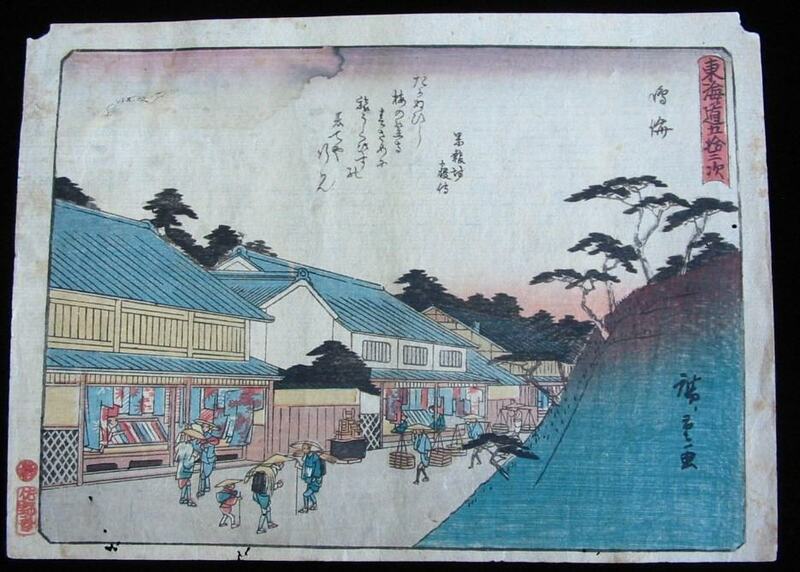 Signature: Hiroshige Ga in Red Panel in the lower left of scene. Authenticity: Scene and Series titles in two panels in upper right of scene. CONDITION: Quite Good for over 185 years of Age with all margins trimmed and a faint smudge from storage with other prints – See Photo. Authenticity: Scene Title in Upper left and Series title in Rectangular panel in upper right of scene. DATE: Recorded to have been published 1849 and the Two Aratame Censor Seals only used together between 1847 and 1853 confirm this date. 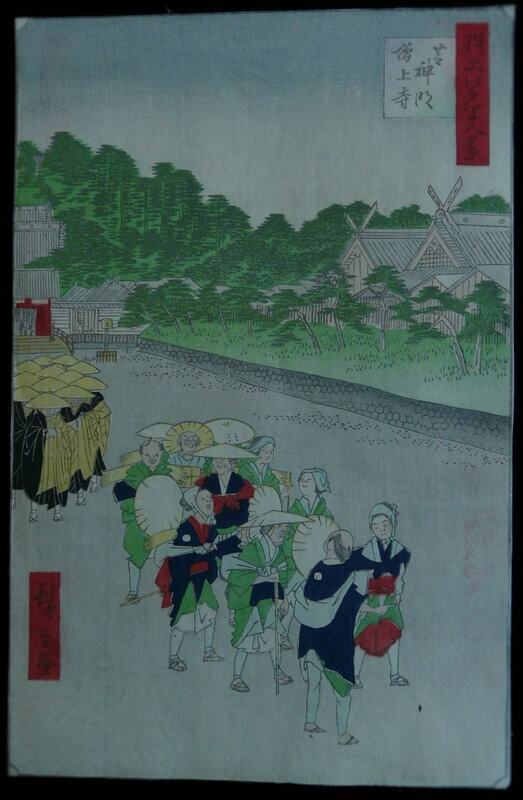 FOLLOWING ARE A SELECTION OF SCENES FROM THE SERIES TOKADO GOJUSAN NO OUCHI: THE 53 STATIONS OF THE TOKAIDO TRAIL, SANOKI EDITION 1804 to 1830. 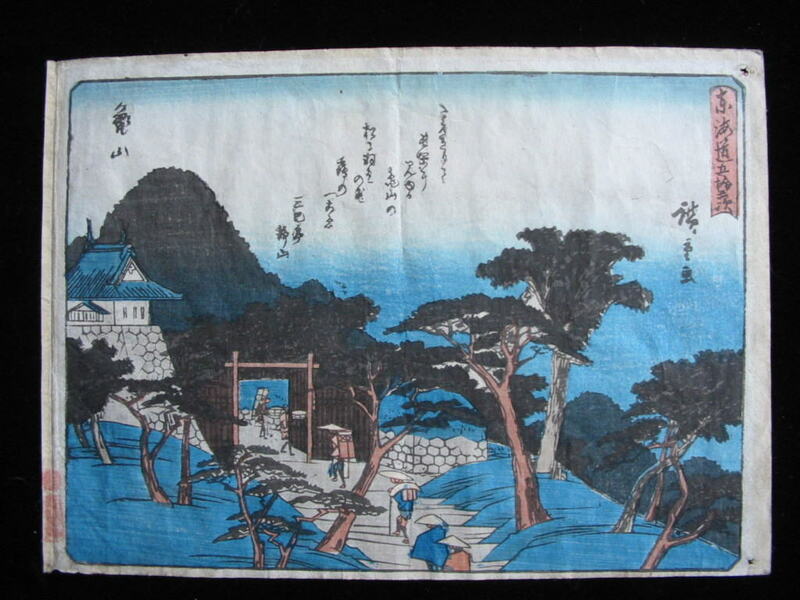 On each of the scenes in this series there is a joke or comic story about the journey or countryside written in the background so it is also referred to as the KYOKA EDITION. 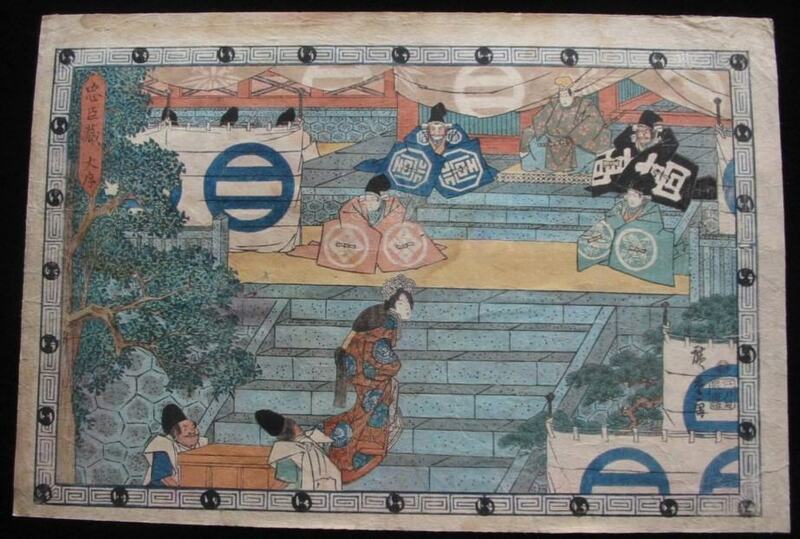 In this Tokaido Series there are actually 56 Stations depicted. Authenticity: Red Sanoki Publisher’s Seal and Round Aratame Censor Seal in Left Margin. Tsuyaya Publishers Seal with Oval Aratame Seal above and Round Aratame on top of signature panel – These two Censor Seals were only used together between 1853 to 1857.